Purpose: To provide a strategy that will enable you to get movement back into any situation or negotiation that is ‘stuck’ in some way. Chunking Up: Gives insights into the higher level interests of all parties and therefore the criteria that must be met for a satisfactory resolution to the issue. 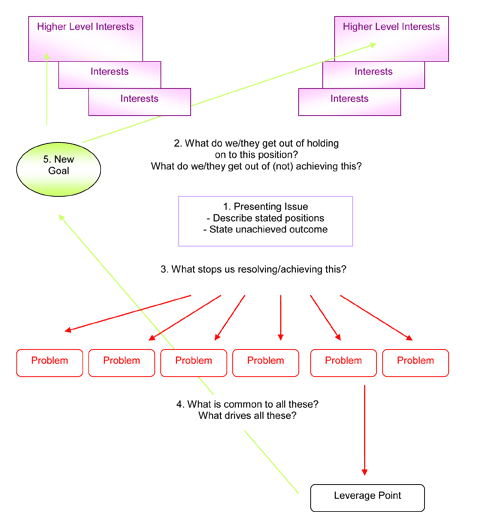 Chunking Down: Provides a way to identify the real cause of the problem and, from that, a leverage point for action. Define the issue and the stated positions of all the main parties involved in the situation, problem or unachieved outcome. ‘Chunk up’ by seeking the higher level ‘interests’ of all parties. ‘Chunk down’ by asking what stops you from resolving this issue. Define the single breakthrough or ‘leverage’ point for action. Create a new goal based on addressing the breakthrough point. Check that the achievement of the new goal meets the interests of all key players. Create a statement of the issue, or unachieved outcome, as you see it at the moment so that the ‘problem space’ is defined. Identify who is involved. Then, mentally step into the mind of the others involved (using perceptual positions thinking for example) and ask the same questions but from their perspective (second position). Ask the questions from an assumption that their situation is ‘normal’ for them even though it may look odd or even crazy from where we are. This will require several iterations to ensure that as many interests as possible for all key players are identified. The reason for making this as exhaustive as possible is that this will provide a useful check once we get to the final steps. In other words it will describe the ‘solution space’ within which the eventual resolution resides. This step may yield a large number of potential obstacles and barriers. From experience we know that the more problems you are able to identify, the easier it is to eventually identify the breakthrough point. As your competence and confidence increases you will be able to incorporate ‘Neuro-logical levels’ thinking in this part of the process too. The approach is to review each of the barriers and obstacles as they are offered and develop a sense of at which level or levels each problem exists. You can then compare this learning with the logical level that the solution will require. For example, if the solution space is at the level of Beliefs and Values then it is likely that the breakthrough point will be at least at that level too. Diligence will be rewarded in this step. What you are looking for is something that if it were to be addressed would have the effect of taking care of all of the barriers identified. The important issue here is that the new goal should be within participants’ control to make happen, based on addressing the breakthrough point. This becomes a new outcome to be addressed, and may have subsidiary outcomes to be achieved as interim steps on the way to its achievement. Does my achievement of this new goal meet the higher level interests and needs that we defined earlier in step 2? Start with the Chunking Up process because this will describe the ‘solution space’ that must ultimately be achieved for a win/win/win. Be rigorous in challenging a belief that there is no positive advantage (interest) from holding on to a particular position or from not achieving the desired outcome – if there was none, it would have been done.